I tend to think of my life as very full and complete. That way when I see something that really, relentlessly grabs my attention I know that means I shouldn't let it go. Like my husband, for example. 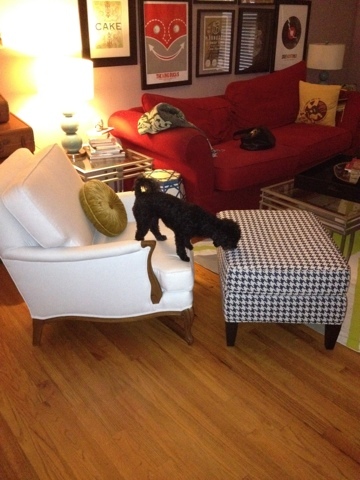 Or my new ottoman. ﻿Love it! 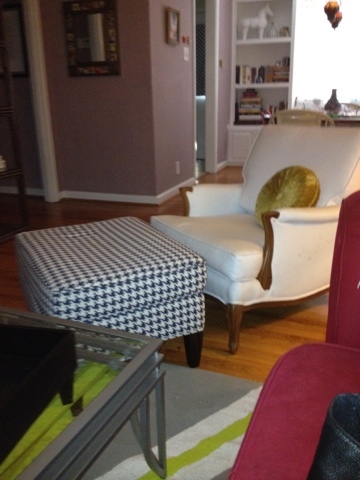 All the funky fun of a Jonathan Adler piece for a fraction of the price and perfect for the subtle London rock vibe of our living area. When I met my mom for lunch yesterday and she suggested swinging by her favorite consignment shop afterwards, I oblidged but my expectations were low. I definitely was not looking for any new furniture. 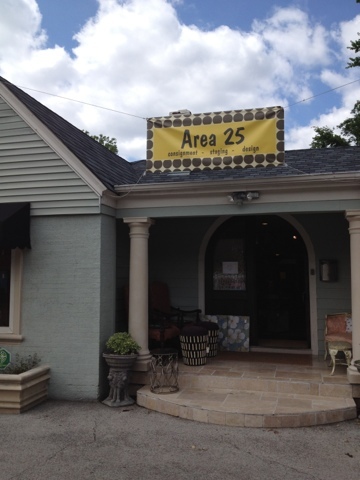 I've driven by Area 25 countless times, but assumed it was a small house with a handful of items that would be more traditional or outside of my quirky taste. I was so, so wrong on both accounts! Street view of Area 25 from Lovers Ln. Back room of Area 25 aka furniture heaven. ﻿If I had to describe this consignment shop in a word it would be "balanced," which is a rarity in the consignment/antique shop niche. There is a great mix of furniure and accesories here where you can make it one of the first places you look for a new investment piece or a place you stop by when you want a few new decor pieces for your place or a gift for a friend. There is a great variance of prices and there's also a great balance of inventory where there is enough stocked in the store where each trip is merited but not too much where you have to dig or can't see everything by walking around. Cheryl from Area 25 explained to me that one of the ways that the shop is able to get such quality pieces at the great prices and unique styles that they do is because many area realtors and interior designers purchase the high end furniture for home staging and then consign them at Area 25 after the house is sold. Many items in the store were of superior quality - probably because they've been sitting unused in multi-million dollar homes waiting for someone to love on them! 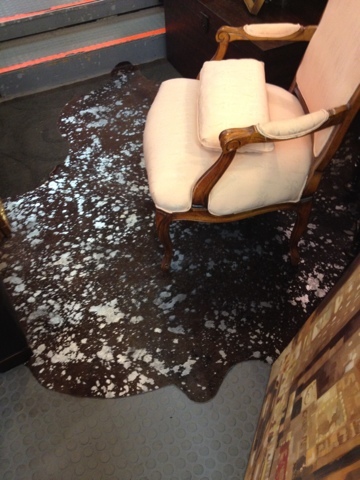 This metallic-flecked cowhide rug. I couldn't personally do cowhide in my home but this one definitely caught my eye! 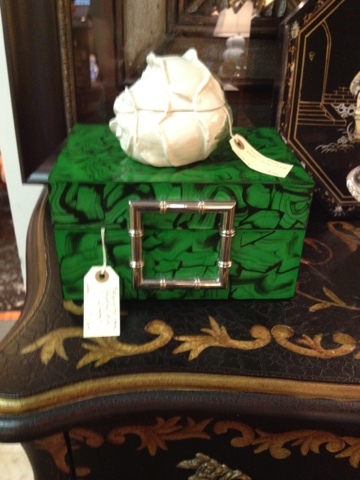 A malachite lacquer box with regency bamboo embellishments. May parents had their wedding reception at the malachite room at Hotel InterContinental so it has a special meaning to me! To see what's new in the store before stopping by, visit Area 25's Facebook page for inventory update photos! I usually never buy a piece like this at first glance and have to sleep on it for at least a few days. 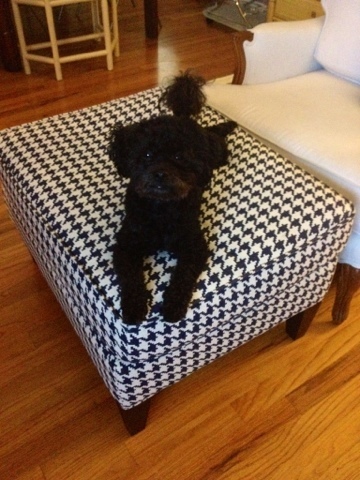 I made it home from the store and immediately had to turn around in my car and buy this ottoman! It was love at first sight and I know better to try to stay away from true love. Have you found a new favorite shop recently? 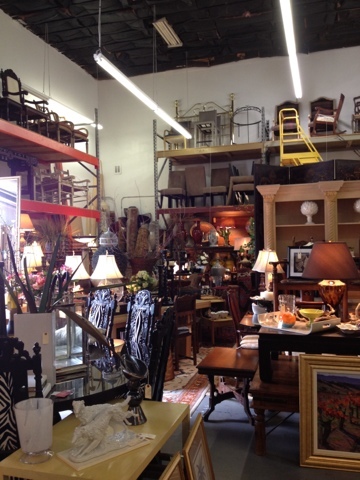 Do you love the thrill of a new consignment or antique find? It's my favorite way to recycle! Dubai antiques shopping has become a matter of attraction for most of the middle-east countries’ visitors. They especially step in Dubai to handpick few of the unique and one of a kind designs in clothing, home decors, jewellery and other accessories. Saga World is a repertoire of classy and royal fashionable collection.